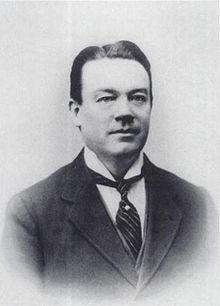 Joseph Devlin was born in Hamill Street, Belfast on 13 February 1871, and was educated at Divis Street Christian Brothers' School. Before becoming a journalist on the Irish News, he worked as a barman. He was returned as member of parliament for North Kilkenny in 1902 and won the West Belfast seat in 1906. He served in the Northern Ireland parliament for Antrim. Until his death he was President of the Ancient Order of Hibernians, which he had revived in 1905. He defeated Eamon de Valera in the Falls division of Belfast in 1918 and retained the seat until 1922. He also represented Fermanagh and Tyrone at Westminster from 1929 to 1934, founded a holiday home for working women and funded outings for Belfast children. He died on 18 January 1934.